There are 50 StarTech.com Rack Accessories products. This set of four casters connects to the bottom of our 42U Adjustable 4 Post Open Server Equipment Rack (4POSTRACKBK), allowing you to move and adjust the position of your rack/cabinet to suit your needs. This TAA compliant product adheres to the requirements of the US Federal Trade Agreements Act (TAA), allowing government GSA Schedule purchases. 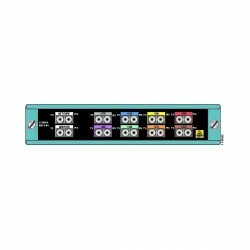 The Cisco® WDM series comprises a set of 11 new CWDM passive modules mechanically compatible with the Cisco CWDM chassis (part number CWDM-CHASSIS-2=) and a 1300/1550 nm splitter cable. Compared to the previous 1000BASE-CWDM series of passive filters, this new set of devices sports a greatly reduced insertion loss (up to 50 percent), "power-tap" ports to allow live monitoring and troubleshooting of the CWDM signals, as well as the mixing of 1300-nm CWDM signals on the same fiber infrastructures.